The Biodiversity Centre for Wildlife Studies, and the Wildlife Data Centre, is about making summary information available. That information is a culmination of your field observations and the subsequent donation of those observations to the Wildlife Data Centre. Throughout British Columbia, only a small fraction of the wildlife present at any given time are observed and recorded. An even smaller fraction of that data are available for making decisions on land-use planning, conservation initiatives, and species or habitat management. However, from the data you do gather, informed decisions can be made. For example, in Wildlife Afield (Vol 1. No. 2) we showed how over 13,000 records of Yellow Warbler throughout British Columbia helped change the way vegetation was managed at Duck Lake in the Creston Valley. Your data can make a difference. Not just in the kinds of articles that appear in Wildlife Afield or are posted on this website, but in the quality of information that is requested through the Wildlife Data Centre. 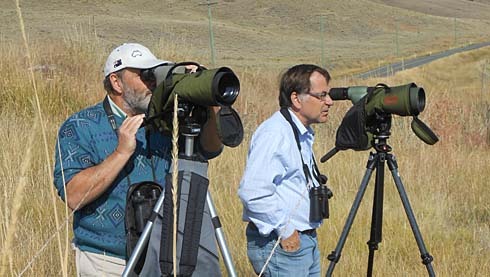 From common species such as American Robin and House Sparrow to less common species such as Golden Eagle and Whimbrel, every observation you make can be incorporated into numerous types of analyses from seasonal patterns of migration to effects of climate change on breeding chronolgy and habitat change. To learn how to contribute your sightings, please view the sub-menu items to the left under "How You Can Help"